Could the Pottery Water Wall be the answer to energy efficient building within arid, desert environments? A recent passive solar submission came from an architect/designer based in Dubai, UAE. 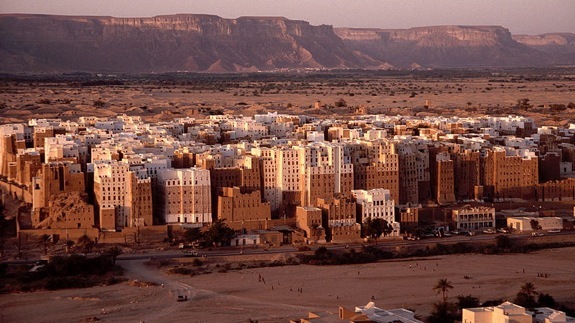 Moustafa Anwar Moustafa is looking to combine the passive attributes of a Trombe or water wall and add convective air elements to increase comfort within buildings located in an arid, desert climate. First, an explanation of the concepts he is building on. A Trombe and water wall both consist of material that has thermal mass. Having thermal mass is one of the essential elements in passive solar building. The thermal mass collects solar heat throughout the day and radiates the heat into the living space during the cooler night. Here are other examples of Trombe walls being used in Zion National Park and a within a house. Living in an arid, hot desert environment that cools quickly in the evening, Moustafa came up with a theory that adds not only passive solar heat to warm the building throughout the colder night, but also adds ventilation and humidity to the equation. His answer is contained within the idea of a pottery water wall that was developed as an upgrade to the water wall. 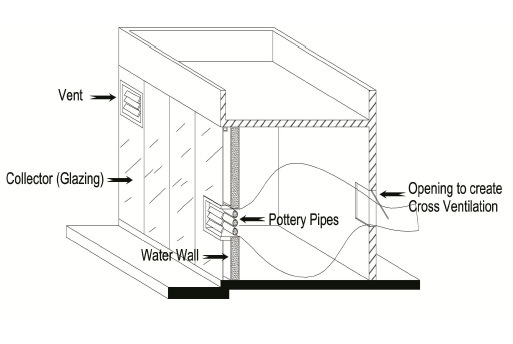 It uses similar concepts of thermal heat storage within the water wall, but has the added enhancement of pottery piping within gaps in the wall to increase ventilation, air flow and humidity within the dry desert air within the home. Similar to a water wall, it stores solar heat during the day and releases or radiates it throughout the cooler night. The Pottery Wall combines the idea of a Trombe or water wall and adds convective air movement to add humidity to the conditioned space. 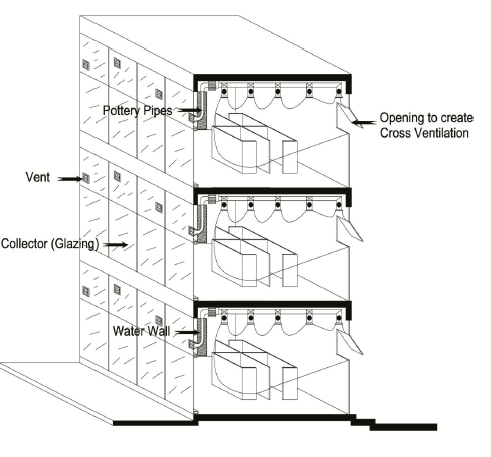 In the diagram to the right, the glass (glazing) is set a short distance from the water wall. Because the wall faces the south, throughout the day it will collect solar heat and transfer the heat to be absorbed in the water wall. Vents and windows allow air from outside to be pulled over the water saturated pottery pipes and into the building. Pottery is a water permeable material. If a current of air passes by the water infused pottery, an air exchange will take place through convection, releasing both heat and humidity into the passing air. Air movement can be created by a passive, or natural cross ventilation vacuum (as heat naturally rises) or by the introduction of a small fan. Passing air will be cooler or warmer depending on the time of day. I’m going to diverge a bit and discuss the positive aspects of using earthen elements such as pottery or adobe. Both have been used extensively throughout the world by different cultures. Both are naturally occurring, non destructive building elements. When they do erode, they go back to a naturally occurring element in nature. They are also porous and naturally absorb humidity. Hopefully the picture above does not confuse the explanation of the pottery water wall, but it warrants mention that adobe is frequently used within passive solar building designs. It has the same positive attributes as other earthen materials, such as the pottery used in the water wall. In hot, sunny, arid climates that have a large range in temperature from day to night and where humidity is desired, the use of a water wall stabilizes the inner passively warmed and cooled temperatures. Both water and adobe has the ability to stabilize temperature swings. During the night, the temperature is typically cold while the water in the water wall is hot from the solar radiation stored during the day. The stored heat passively warms the living quarters with radiant heat during the cooler night. As the water wall releases its heat, it slowly cools. By the morning, the wall is cold, and will slowly warm as the sun shines on it. Because of its mass, it will not immediately warm, and will work to keep the house cool. The Pottery Water Wall allows for both evaporation and ventilation from the earthen piping to increase humidity within the home. The wall cools the living quarters with ventilation and evaporation, as the air passing by the pipes is much cooler in the early morning and afternoon. The lack of ventilation and humidity in dry desert environments is solved by introducing this simple concept. Take a look at the animated video of this concept. At this stage, the Pottery Water Wall is simply a theory, further experiment and analysis is needed to define the optimum dimensions and thicknesses. Moustafa intends to test the ability of the Pottery Water Wall’s influence on indoor temperatures and humidity levels. Moustafa Anwar Moustafa was educated at the University of Alexandria, Egypt. He is currently a practicing architect and designer in Dubai, UAE. Design (A): Is an ordinary water wall using metal or plastic containers on the south facade behind a collector (glazing). It has an opening with pottery pipes running within it having water in it passing from the water wall. The opening is attached to the outdoors through an insulated frame with a vent to control air flow. As described above when the vent is opened the air passes because of cross ventilation and convective air currents. This is a system that would be utilized in smaller buildings.